"Blattfedern Repositionierungskit, 66-70 B-Body, nur Dodge"
Features stock bolt location plus 1″ inch up and 1″ inch down bolt location! Leaf Spring Relocation Kit US Car Tool does it again. Well known for their chassis stiffening products, US Car Tool has now created a kit to help Mopar car owners get even better performance by providing up to 8″ more room for rear tires. Anyone who has ever looked underneath the rear end of a Mopar notices the leaf springs are in the way of really wide tires / wheels. Racers and chassis fabrication shops have been moving these in for years, and believe me; it is not as easy as it sounds. Why do you think all the race cars ads say ″ Hooks hard and goes straight″ , unless going straight was not the norm? 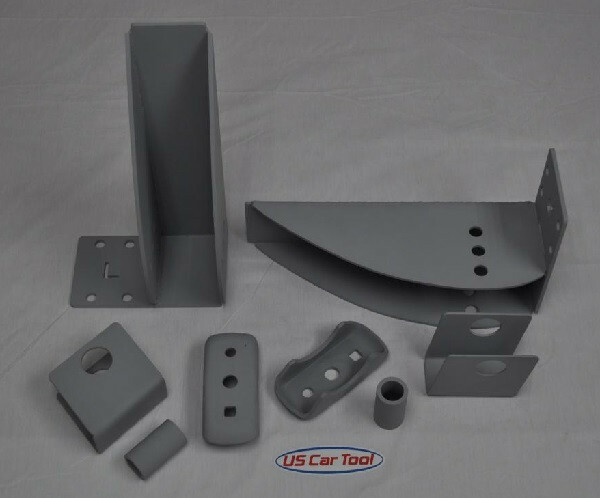 The US Car Tool leaf spring relocating kit is self aligning off the factory leaf spring mounting holes and includes instruction on how to cut the factory frame rails, locate and weld in the new front and rear mounts and measure to be sure you are straight and square. This kit won't make you a chassis shop, but it will help an advanced hot rodder gain up to 8″ of tire tread space in the back of that Mopar!